First the bad news : we are still on Lothal and it is still the most boring planet in all of Star Wars. Not much actually happens in these episodes and Crawler Commanders almost violently put me to sleep about 45 times. If you’re still reading and you are curious about the good news, Kindred isn’t that bad. 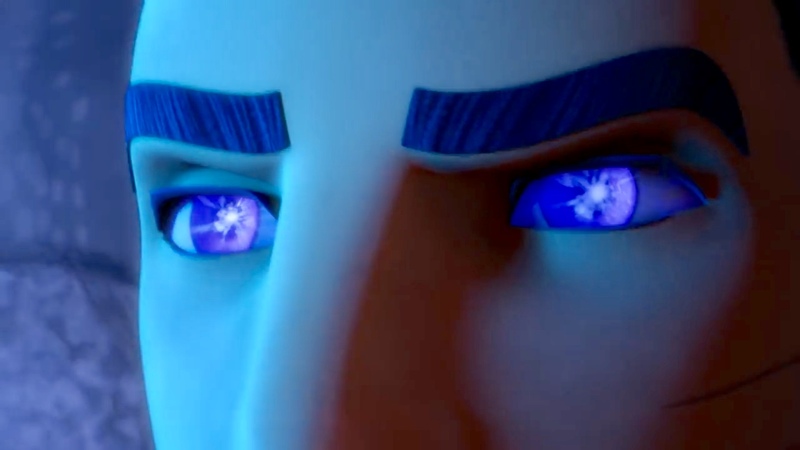 It hints at some interesting stuff that could be coming and there’s just something dang intriguing about those giant Force Wolves. So in our last back to back, let’s hurry up and get this show over with, two episodes at a time style, we get a very mixed Rebels bag. There’s decent stuff in especially the first one but man oh man, this show is riding a speeder bike straight to it’s quickly approaching end. Things get started with Hera and Kanan spending some time together having deep thoughts on what we’re all wondering, just why they are still on Lothal. Kanan wonders if there’s a deeper purpose that keeps bringing them back there and I honestly hope that’s the case. Cut to that dastardly villain who can’t get anything done, Thrawn as he unleashes his gorilla mixed with a pencil eraser assassin thing named Ruhk on the Rebels. Ruhk jumps out of his ship smelling for Zeb, rides a speeder bike, fights Ezra and then he’s pretty much out of the episode. Maybe and hopefully he’ll turn up again in another episode but for now he was a total waste of time. Ezra and crew hide out in the cave mountains and the Force Wolves show up and naturally they ask for Kanan. Next thing you know Ezra’s eyes get crazy and faster then you can say Carlos Castaneda in the desert, they’re on the other side of the planet. Just like last season’s Bendu, I like the idea of creatures that thrive of the living and cosmic Force but aren’t necessarily Force users. I’m hoping and sensing that these wolves will actually lead to something at may help bring a satisfying conclusion to some of our main characters. Or maybe they will talk more and remind Kanan and Ezra that the greatest power in the universe is the strength of family. We’ll find out! After that, there’s some stuff about a giant mining crawler, some Trandoshans with electric whips and Ezra grinning when a Seth Green voiced lizard man accidentally falls to his death. It’s weird and it definitely is not one of Rebels’ best episodes. The good thing going on with Kindred there’s moments that feel like this thing is going somewhere. It has a nice forward momentum to it that sometimes Rebels episodes severely lack. Watching it though I can’t help feeling like this first half of season four has been phoning it in. I think back to episodes like Maul’s flirting with the Ezra and the dark side in Twilight of the Apprentice, the Bendu’s lesson for Ezra and Kanan to learn that they needed each other last season and it makes we wonder what’s going on this season. 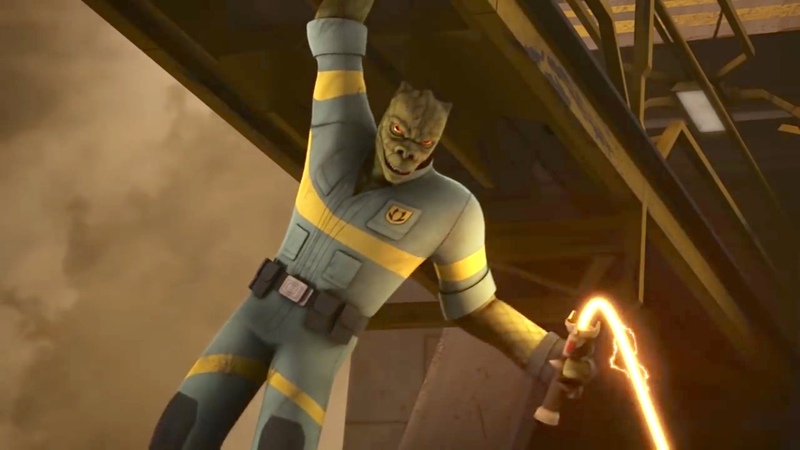 We’ve got a handful of episodes left and we are getting Bossk dudes with electric whips. 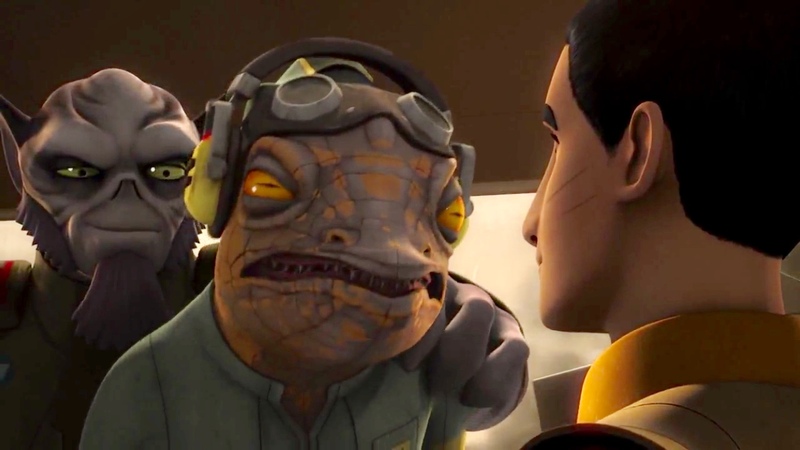 Don’t get me wrong, I love a good Bossk with an electric whip and the promise of X-Wings next week but that leads to my weekly gripe that’s still valid, what about the characters? And not the characters from Star Wars movies or Clone Wars, what about the Rebels characters? 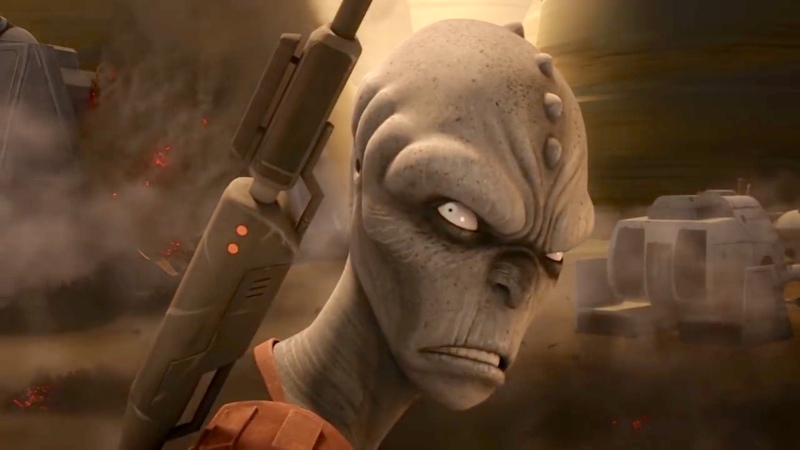 It’s time for this show to address the Bor Gullet in the room and start to lay the foundation that give these Rebels their final act. Save the Bossks with whips for the next show. Or my dreams.